The Dunedin Skillshare 2015 was excellent! 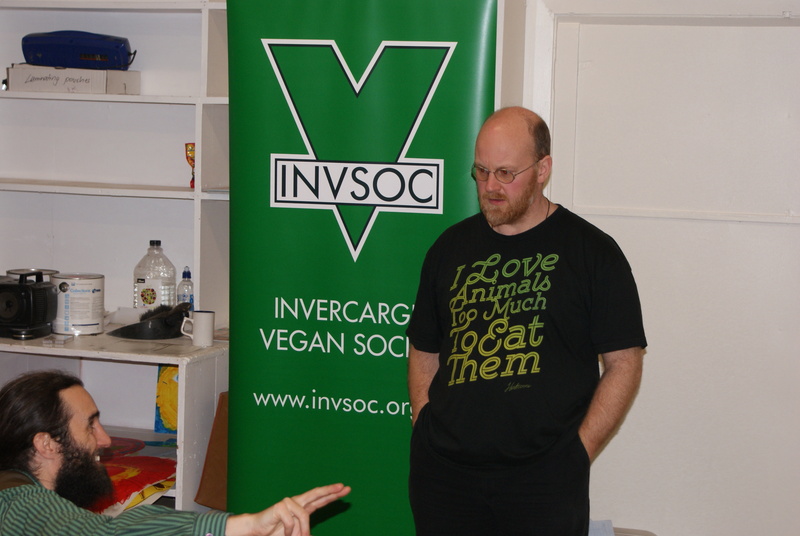 An opportunity for southern animal rights activists to come together, Invercargill Vegan Society (INVSOC) coordinators Jordan and Jen couldn’t wait to learn more! Michelle pretended to be a reporter, using a handy hairbrush as a microphone! “We ended on the really positive note that was Jenny and Jordan’s talk which left everyone feeling great and ready to go. A little talk about where to next followed but it was such a big day (all of that in one day) that not much of that was possible. 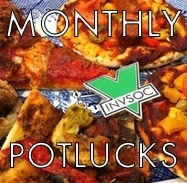 A plan was made to have regular monthly Vegan potlucks which we can do more planning at however. 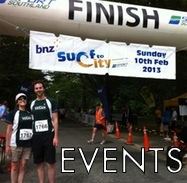 My sister, who is the Dunedin SAFE Coordinator and I catered the event with Vegan nachos and plenty of cakes etc. 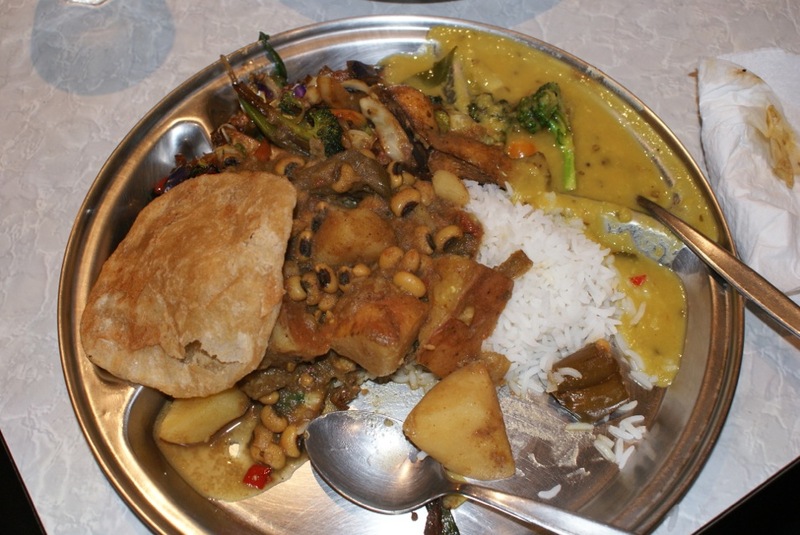 Given that food always wins Vegans or borderline Vegan’s over, that was a good strategic move! Erin also did beautiful karikia’s at the beginning, end and before lunch, and we lit a candle for the animals and left it lit all day. 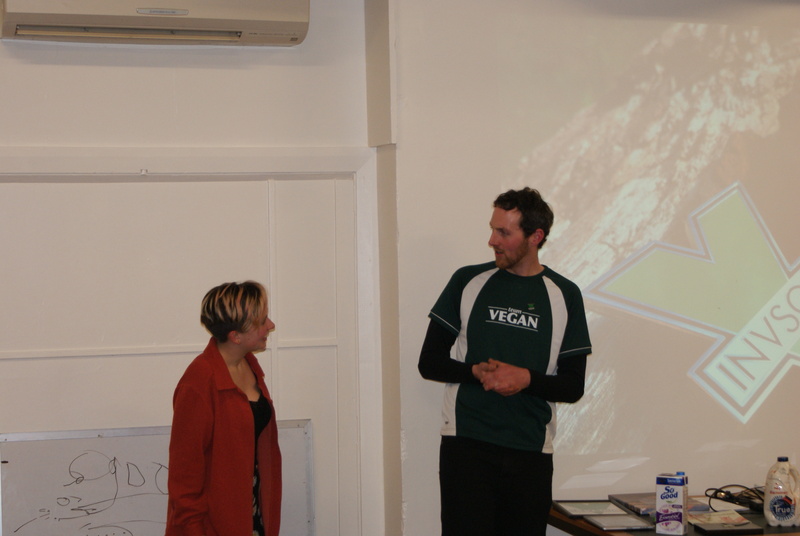 At the end of the workshop, we represented the Invercargill Vegan Society, and spoke about vegan advocacy. 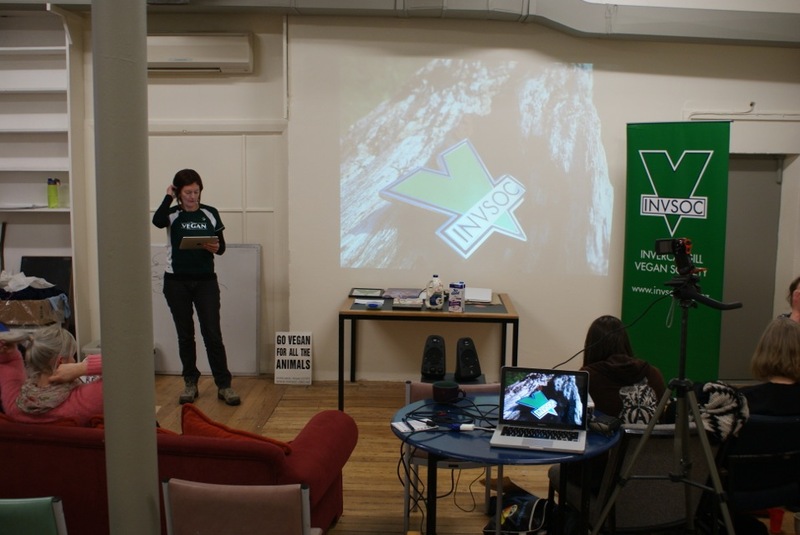 Setting up early, we released The INVSOC-olith banner. 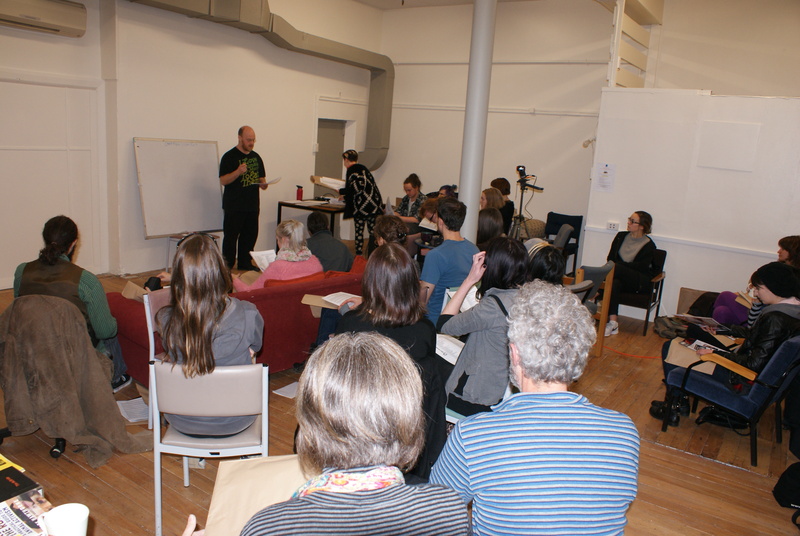 Our vegan workshop focused on brief introductions of ourselves, and a selection of vegan activism that we had found effective in Invercargill. 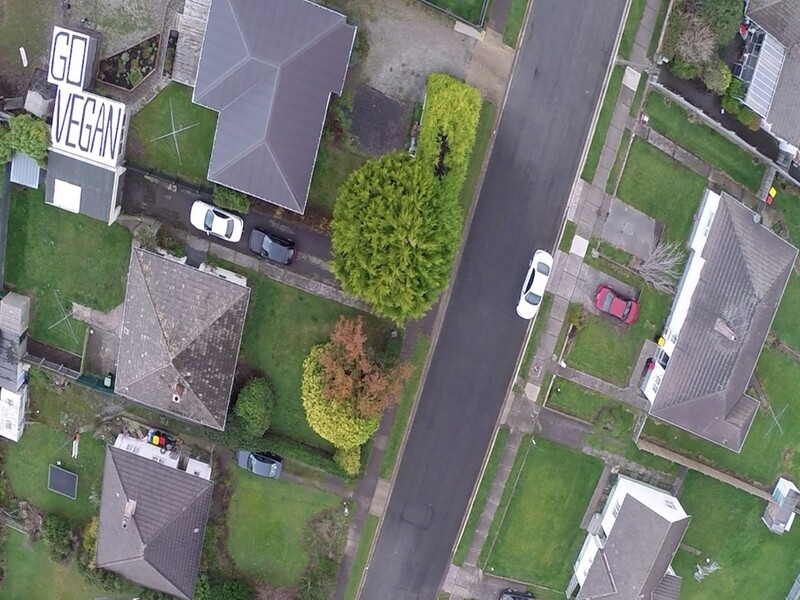 We suggested specific examples that would easily work in Dunedin. 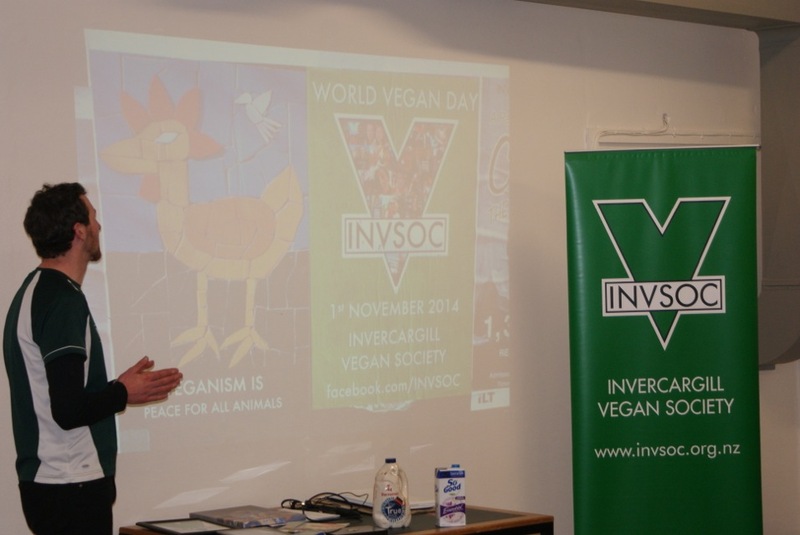 Finally, our presentation ended on a roleplay of seizing everyday opportunities for vegan activism! 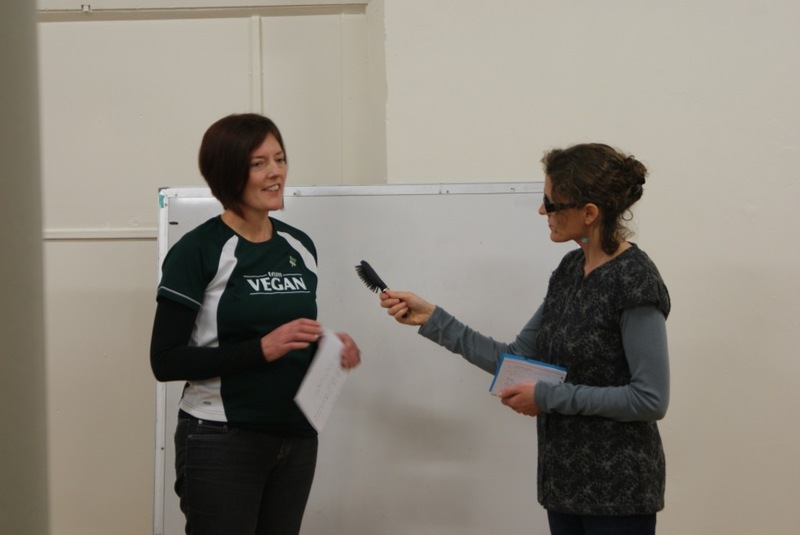 Invercargill Vegan Society coordinator Jen shared how she began her journey to veganism. She had loved seeing lambs playing, and then, that night, her mother announced they were eating roasted lambs for dinner! 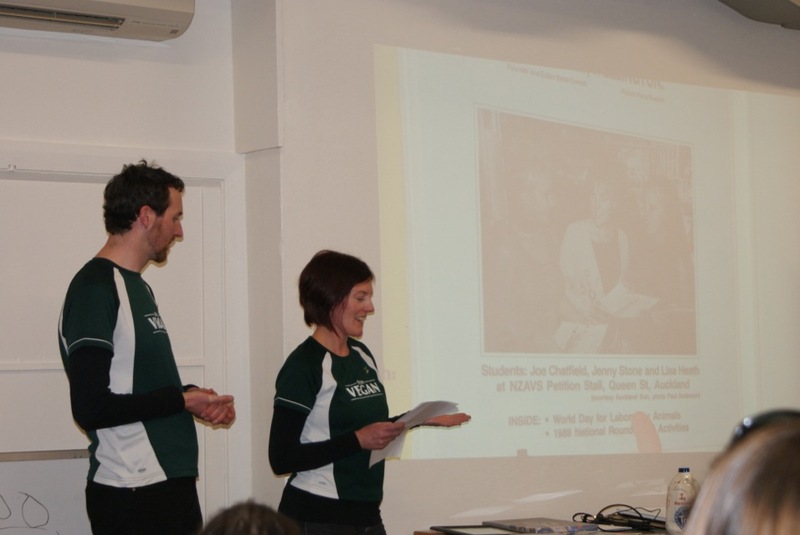 INVSOC founder Jordan spoke about how it all came to him in a dream, suggested by a ghostly apparition of Roger Yates. Jordan talked about loving baby chickens as a child, and yet grew up with speciesism: being an animal lover, who ate and used animals. Jen spoke of her volunteer work with the New Zealand Anti Vivisection Society (NZAVS) as a teenager. 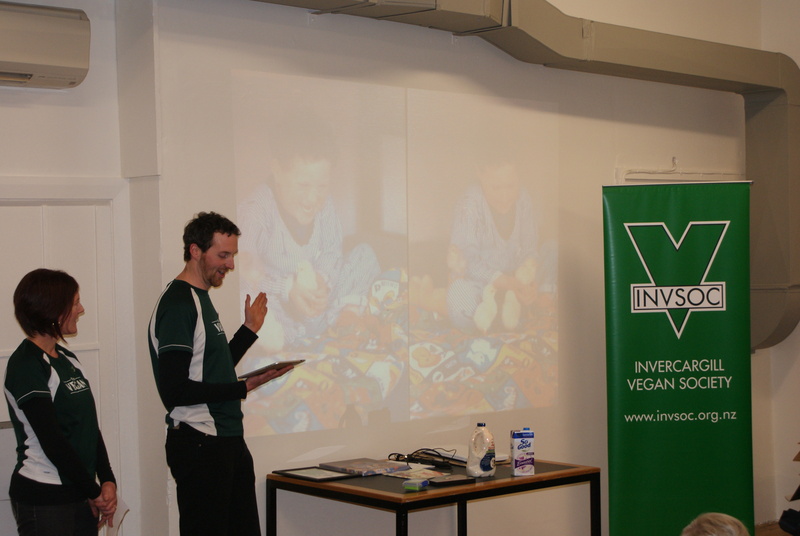 One of our key themes was of veganism being part of the peace movement, of kindness, respect and love. 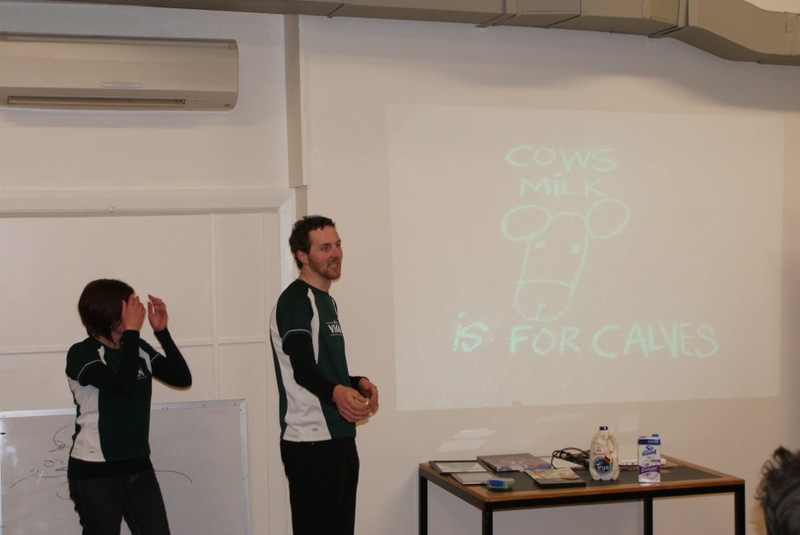 As sappy, and dairy-free cheesy as that sounds, we asked if anyone in the room had been born vegan, if anyone had been vegan their entire life. 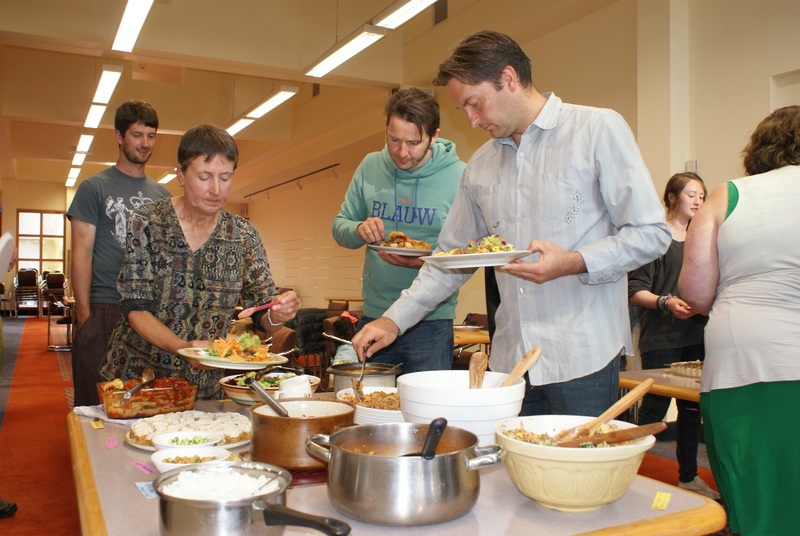 Of the ~30 people in the room, ALL of us had eaten, worn and used animals. As such, we try to hold this in mind in talking with others about veganism – that we too ate KFC, and wore animal skin. 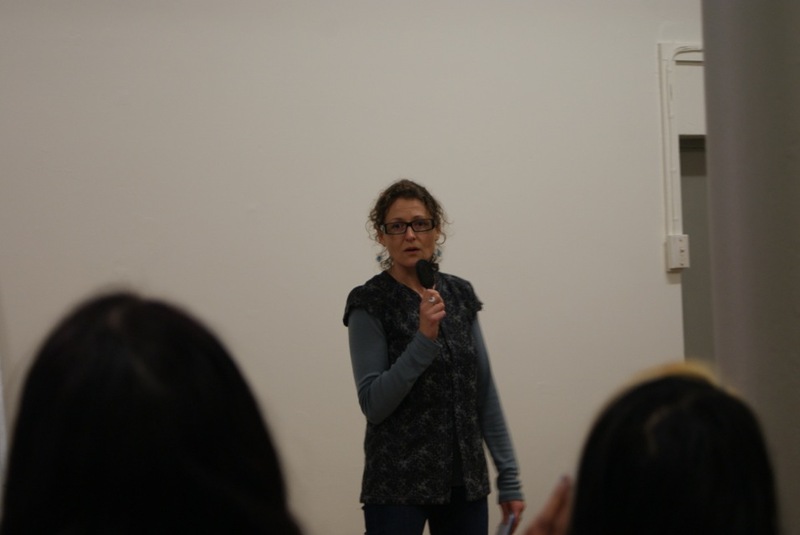 Everyone deserves a second chance….and a third, and fourth! 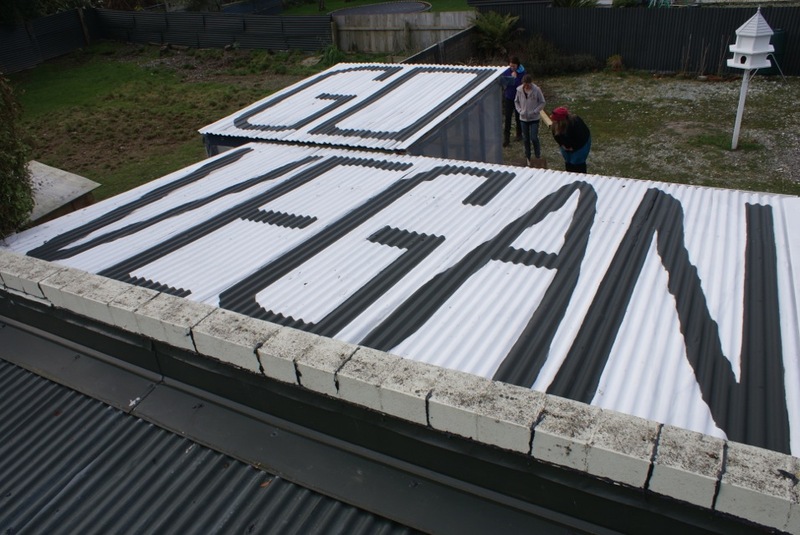 There are even, “The Slaughterhouse Redemption“, Invercargill Vegan Society members who worked at freezing works, killing animals, and who now believe in veganism animal rights. They made it, through a tunnel in their cell wall, scurrying through a sewage pipe, into the world of veganism, respect for animals :-) As such, everyone deserves respect, and ANYONE can go vegan! 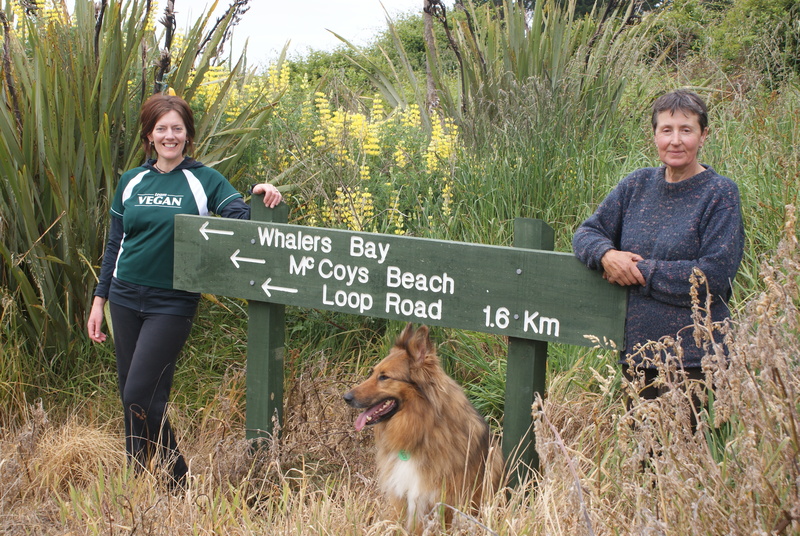 Nikki lives very close to Whalers Bay, at Sandy Point, where we formerly KILLED WHALES. 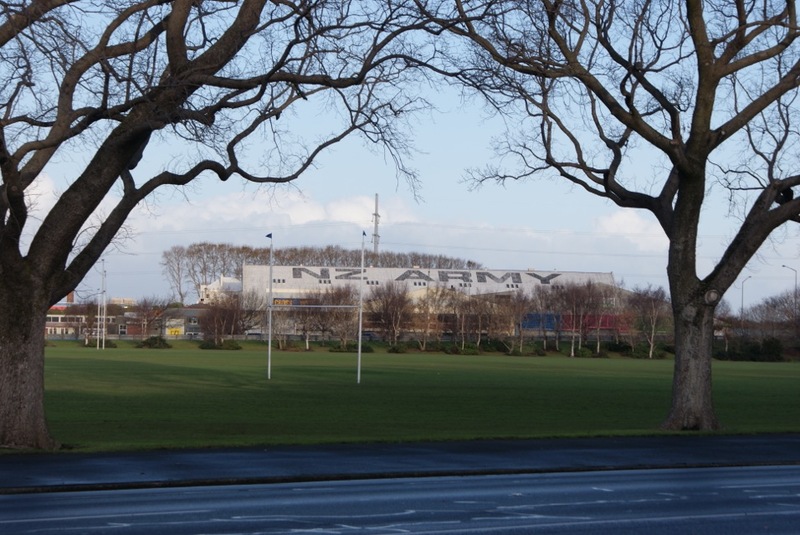 You’d never guess it based on the name Whalers Bay, but whale-killing was fully legal, and of great economic importance to New Zealand. Totally barbaric of us to kill whales, right? 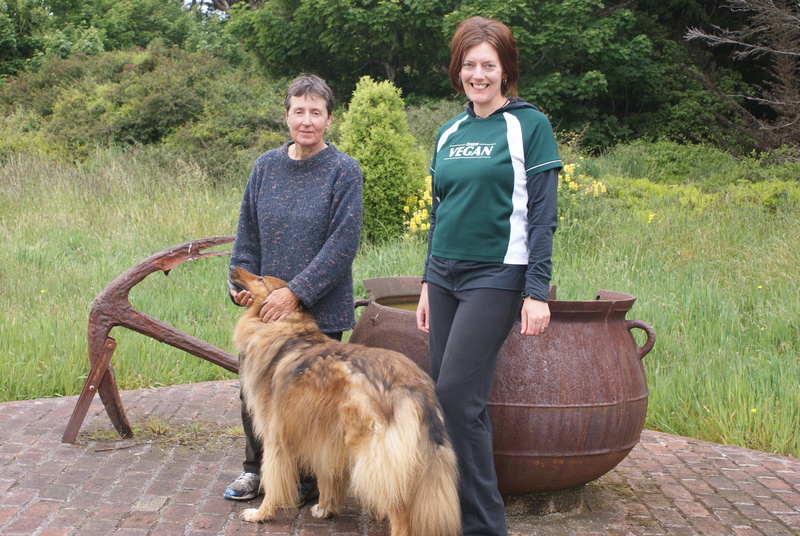 And judging on the cast iron whale pot and rusty anchor, it must have happened AGES ago……yeah? 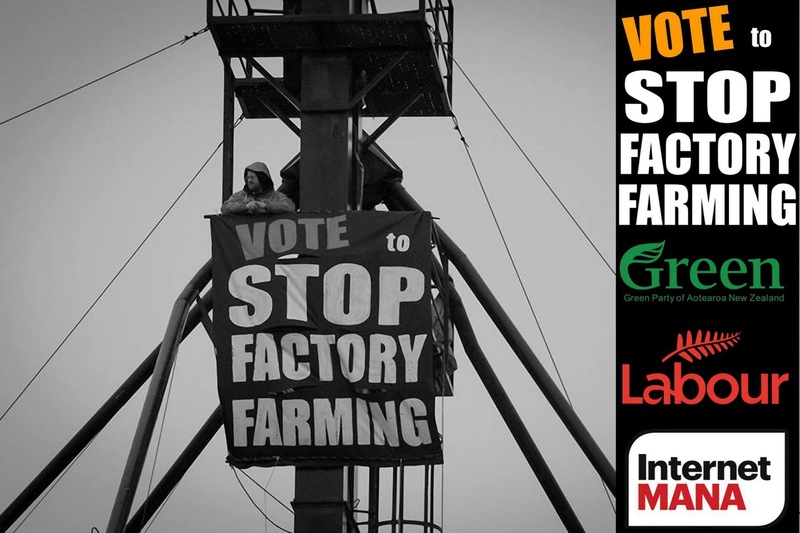 New Zealand Whaling last happened in 1964. That’s only 51 years ago, in some of our lifetimes! And yet, to kill a whale or seal now, would be unthinkable, unspeakable evil. 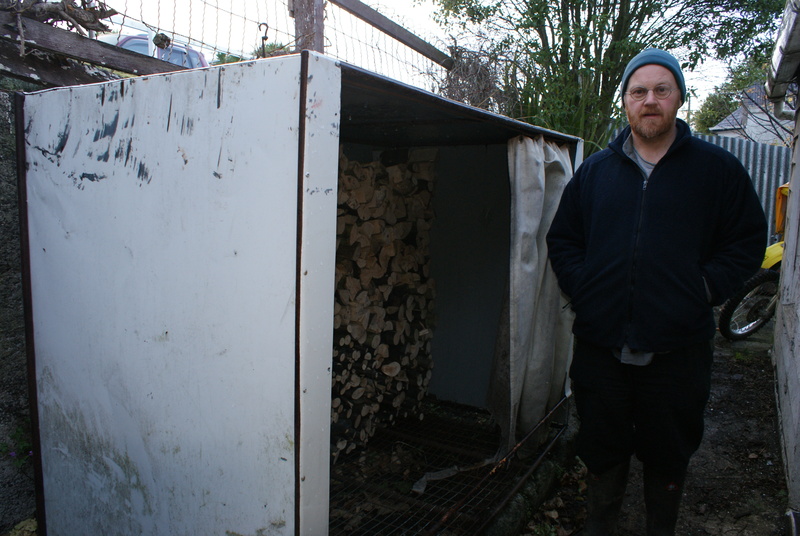 How long until we look back in embarrassment, regret and fon-terror at the 2010’s dairy industry? 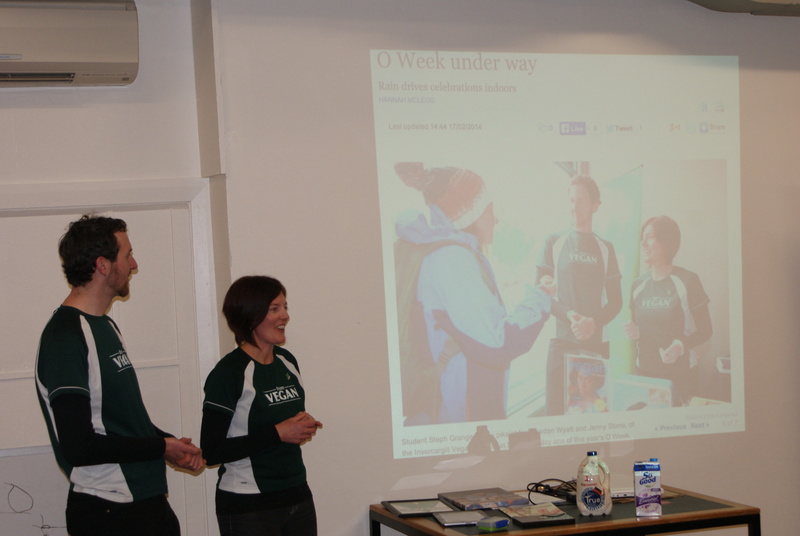 Jen spoke about attending SIT’s Orientation Week each year, with a colourful vegan stall. 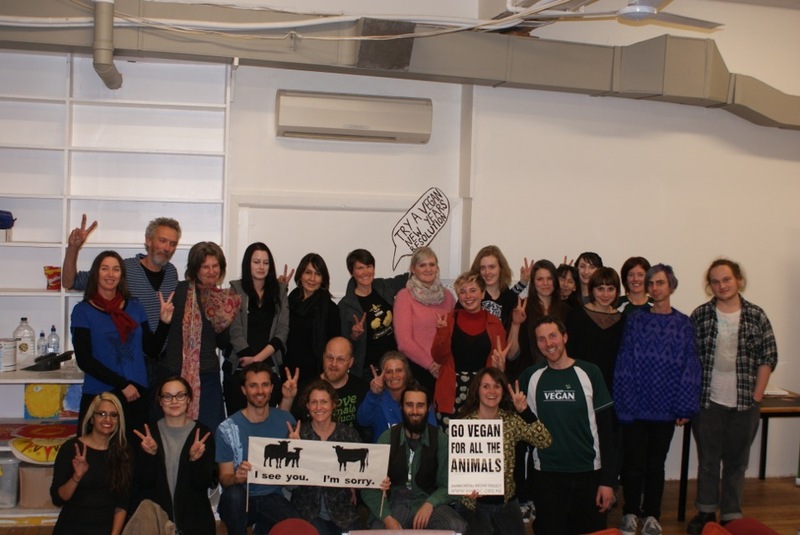 For the final section of our vegan advocacy workshop, we asked for volunteers from the skillshare audience to join us in pretend everyday activism. Jordan played the role of a man looking to buy soymilk in a supermarket. 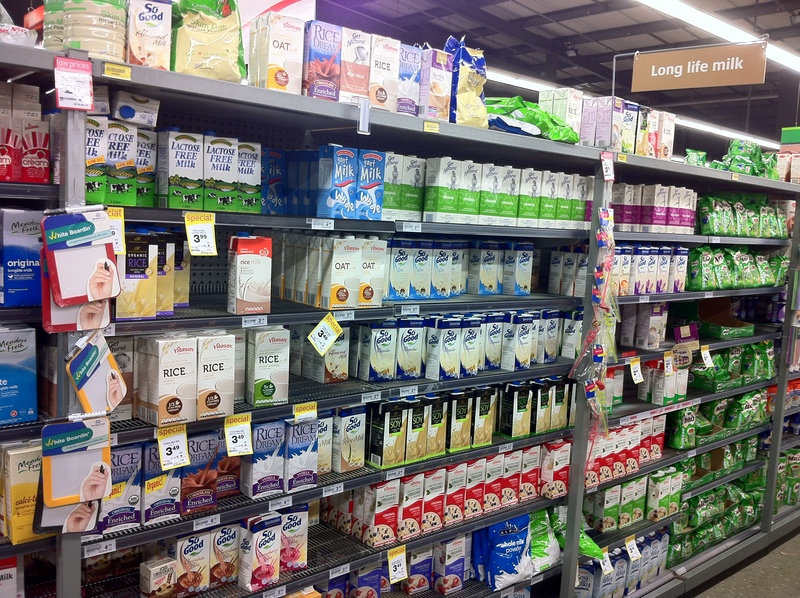 Shopping for a vegan relative coming to stay, his character was overloaded by the vast variety of vegan friendly plantmilks on offer! How do you choose which one to buy? 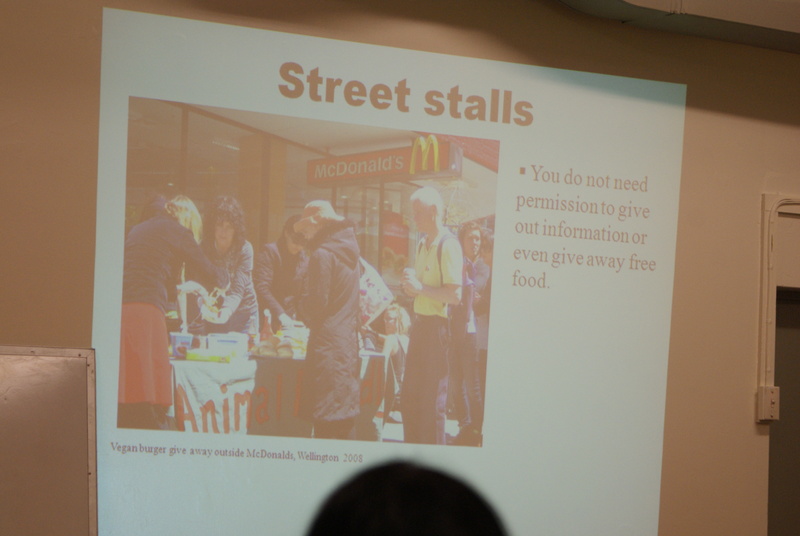 “The Helpful Vegan Activist” saw our confused citizen, and sprung into action. 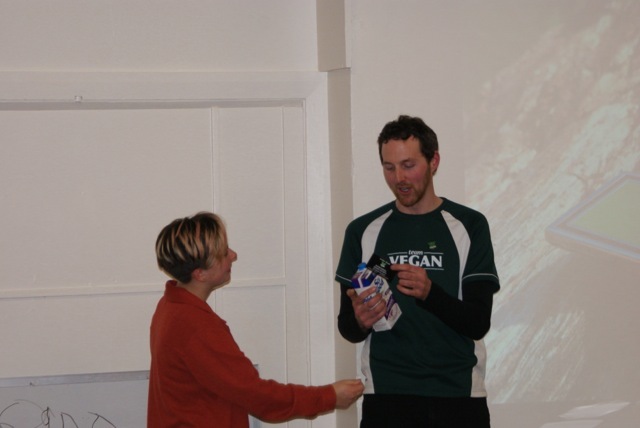 She suggesting her favourite type (apparently So Good Essential), and briefly chatted to the man about veganism. 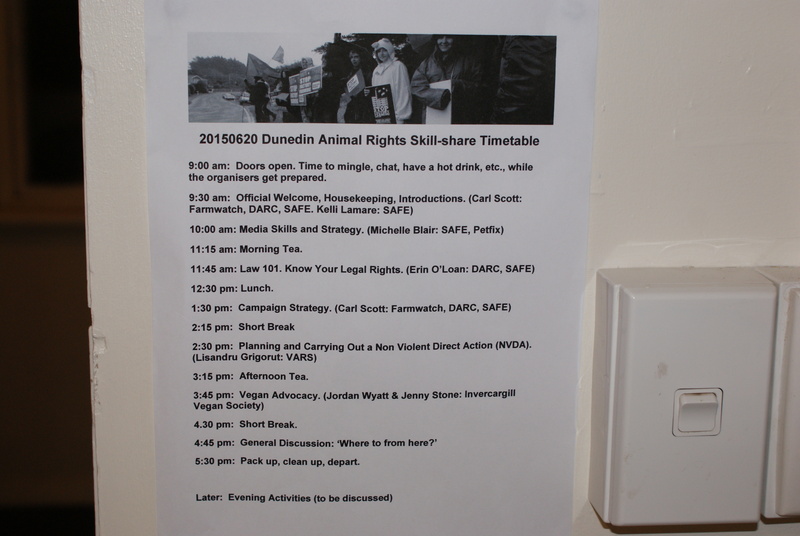 Invercargill Vegan Society co-ordinators Jordan and Jen had a great time at the Dunedin Animal Rights Skillshare 2015. 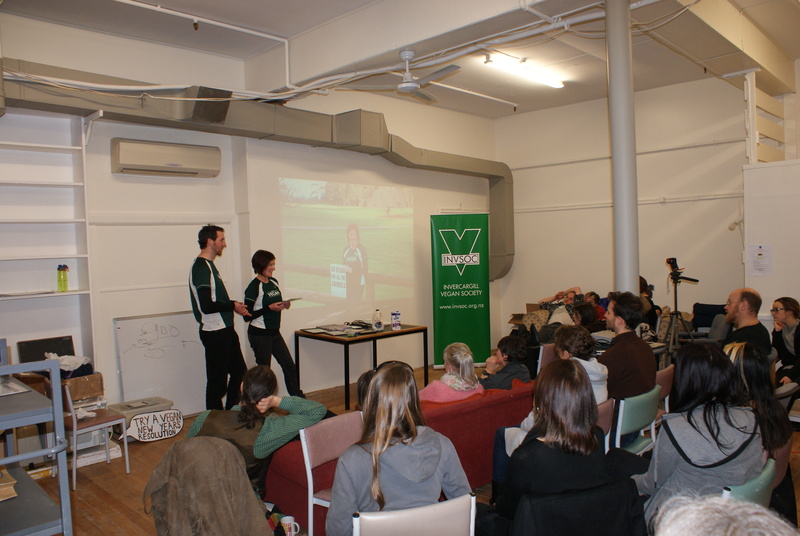 We learnt from many talented and passionate activists, and our journey of discovery never ceased. 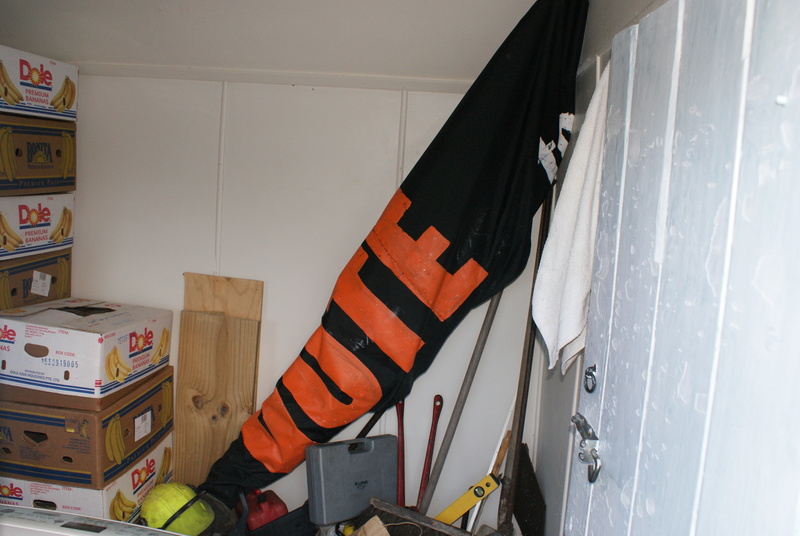 Staying with Carl Scott, we found a famous banner in his shed. 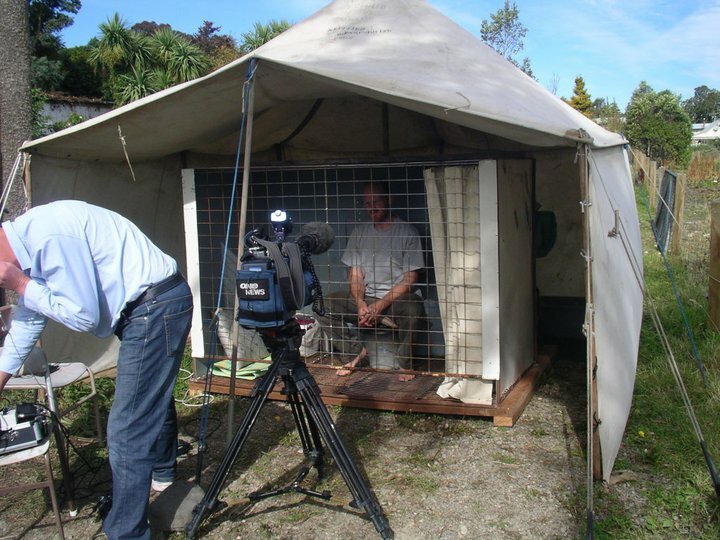 Remember Carl Scott a few years ago, when he stayed in a reproduction chicken cage for a month? He rose awareness of the New Zealand egg industry, and spoke to the mainstream media about veganism. When we create the “New Zealand Museum of Animal Rights” here in Invercargill, we’ll have to buy the cage as an exhibit! 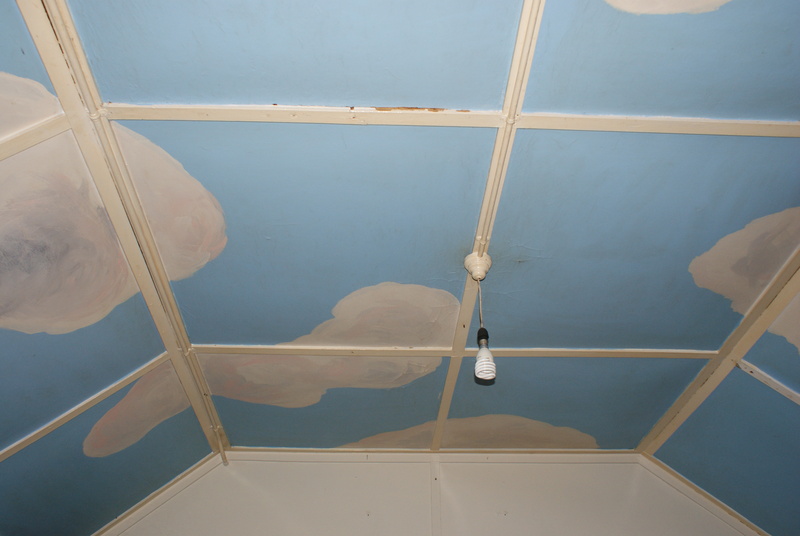 In a stroke of sheer genius/coincidence, one room of Carl’s house has a fantastic artwork painted across the ceiling. 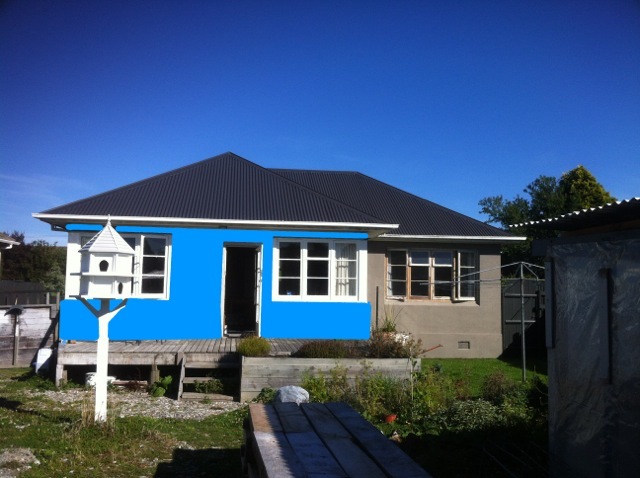 A light blue sky, friendly clouds….it’s simply marvellous. Dunedin also gave the inspiration for the three metre INVSOC HQ “Go Vegan” roof sign. The “NZ Army” hall visible in South Dunedin gave Jordan the idea of rooftop advertising. 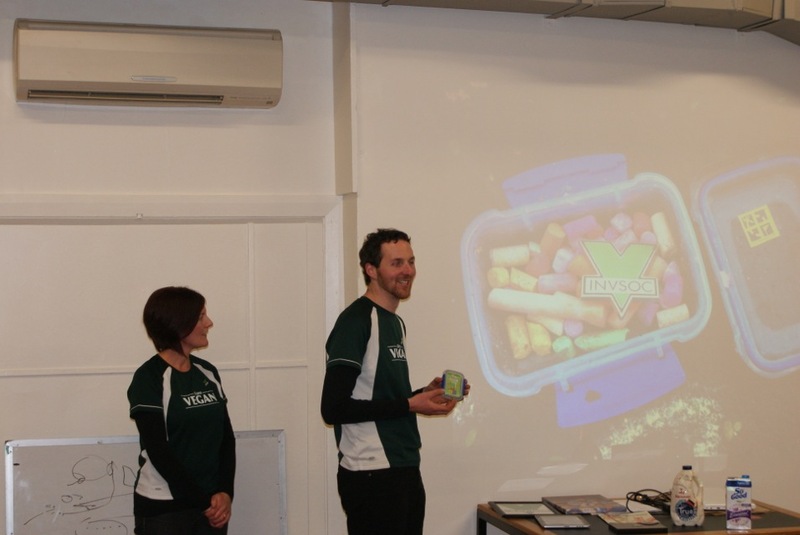 They’re a progressive bunch in Dunedin, filled with passion, and are sure to spark inspiration/kleptomania in visiting Invercargillians. 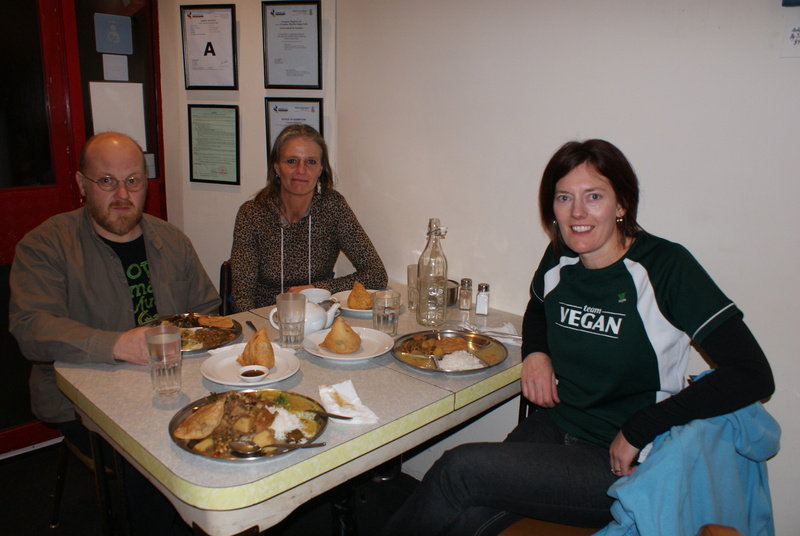 Before we returned home to Invers, we stopped by Circadian Rhythm cafe for the $13 buffet! Thank you Dunedin, for a fantastic Animal Rights skillshare!